Christine Okon has always enjoyed sharing her experiences with theater, art, literature , media, nature, design and everyday happenstance. She has a special fondness for what she calls “small and ambitious black box theater” and appreciates the creativity of the Bay Area. An early pioneer in the growth of multimedia in the Bay Area, she feels privileged to have coauthored the book Demystifying Multimedia for Apple, designed and taught the Introduction to Multimedia course at San Francisco State University Continuing Education program, and published articles for several digital media magazines. A native of Chicago, she holds a Master’s degree in English literature and linguistics from Northern Illinois University and has many fond memories of excellent performances at Steppenwolf, Goodman and other great Chicago theaters. 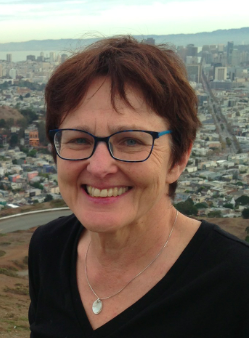 Currently, Christine lives in San Francisco and writes about the patient safety aspects of healthcare technology. She is also currently working on a play.